Wooden doors are a great way to decorate the exterior of your home and offer a complementary look for both modern and traditional style homes. This style of door also offers a practical and functional security solution for a range of homes but is sometimes considered weaker in comparison to its uPVC counterparts. Home security is an important element in keeping both you and your family safe and secure. Doors play an important role in providing this extra peace of mind, so ensuring each door has the adequate protection should the worst happen is key to keeping a happy mind. There are a few things to consider when securing a wooden door and getting the best level of protection for your doorways and entrances. Assessing the different types of threats that could affect your property will assist you in choosing the best option for your home and help you avoid costly consequences in the long run. There are also similar precautions you should take as a business owner in Western Australia as adequate security for any wooden doors around your premises will help to protect company equipment from potential threats. Take a look at some of the ways you can improve the security of wooden doors and general access to your property. Getting a professional locksmith in Perth to install a high security lock is a great way to ensure you have adequate protection for your home. High security locks made from durable and strong materials are best for this use, as they can withstand a larger amount of pressure from forced break-ins or covert entry methods. Locks that incorporate deadbolts are also ideal for home security, as they prove more resistant to bypass methods. There’s a good chance that the screws in your doorframe are standard lengths, which are only sufficient in holding the strike plate and hinges to the doorframe. A really simple way to add to the strength of these areas is by fastening these components with longer screws. The length of the screw enables this area to have a tighter grip in the event of it being forced open. Door chains are a traditional and popular way of adding security to a wooden door. This protective method is easy to install and is an affordable way to give you extra peace of mind. Door chains have a variety of uses including allowing you to check who is at the door before fully opening it and providing a barrier to anyone who tries to force entry. 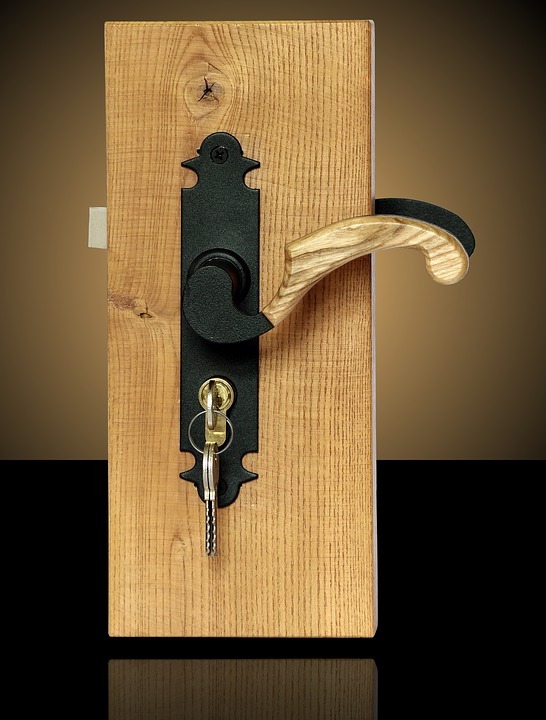 Installing a kick plate on your wooden door adds an extra element of strength in the event of forced entry. Kick plates can be tailored to match the aesthetics of your door and fit with a range of different styles. Some kick plates can withstand up to 1000lbs of force so provide an increased level of protection when installed by a professional. This small hole on your doorway can help you check who is at your front door before you open it. Peepholes provide a panoramic view of the outside area so it is difficult for perpetrators to hide, which gives you peace of mind if you are in the property alone and do not want to open the door. 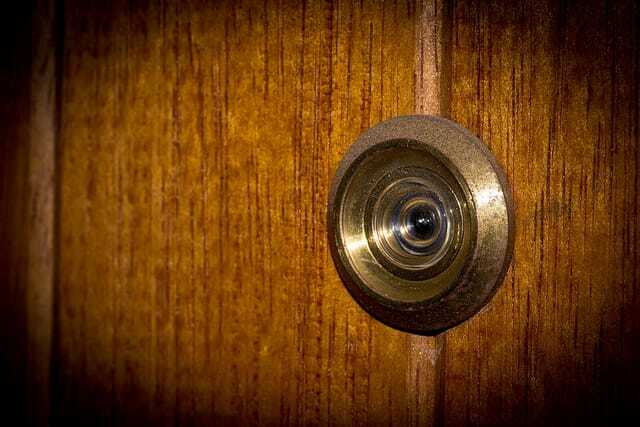 There is also the option to have peephole cameras installed on your doorway, which shows you the person at the door directly to an app on your phone. For extra protection from the inside that you can control, a door jammer or security bar is an ideal option. There is a range of designs available from fitted security bars for any style of door to portable door jammers so you can feel safe whilst visiting and staying in other locations. Security bars are often very hardwearing and strong which makes them ideal protection from break-ins. They can also provide increase security for sliding doors where the locking mechanism may be weaker. Door jammers are also handy for travel use or protection from inside a property as the bar provides increased resistance when forced and jams underneath the handle. If you feel your property is particular vulnerable or your want ultimate peace of mind, installing security cameras near your entrances or doorways will help to deter potential break-ins. This is also particularly useful for business owners who have larger sites with blind spots or hidden entranceways. There may be some restrictions on where you can install security cameras, so be sure to check out local regulation. For extra peace of mind, installing security gates on the exterior of your property is an ideal choice. Specialist gates provide strong and durable options with increased protection and are often situated at gateways before anyone is able to approach the doorway of a property. Security gates are also an effective deterrent for people looking enter a home unlawfully and some can alert you when they have been breached. We all like privacy in our homes but concealing entrances or allowing foliage to cover aspects of your exterior space, offers vulnerable spots around your property. Keeping pathways and doorways clear of shrubs and tall fences helps to keep these areas visible to others especially neighbours, who can be a useful resource in keeping an eye on things when you are out of town. Having natural borders around your property still allows privacy but also helps you to stay alert if anyone is snooping around. If you are considering upgrading your current security systems, hiring a professional locksmith in Perth will help you choose the ideal preventative option for your home. Call Action Lock today on 08 9240 7200 to discuss your security requirements or visit us at our shop at 8/30 Erindale Road, Balcatta, WA 6021. This entry was posted in General Locksmith, Safes, Uncategorized. Bookmark the permalink. ← What is an Anti-Snap Lock?